A second, long snorkel session at Gylly Beach yesterday. 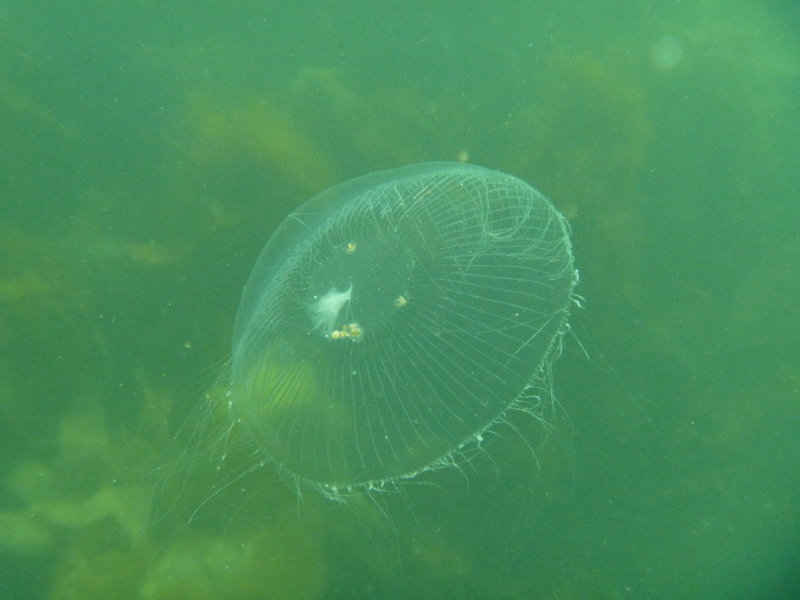 Loads of Sand eels, no cuttlefish but there were a couple of beautiful Compass jellyfish Chrysaora hysoscella around, with tentacles up to a meter long (first pic). Smaller and less visible was Aequorea forskalea or A. vitrina (second pic)*. 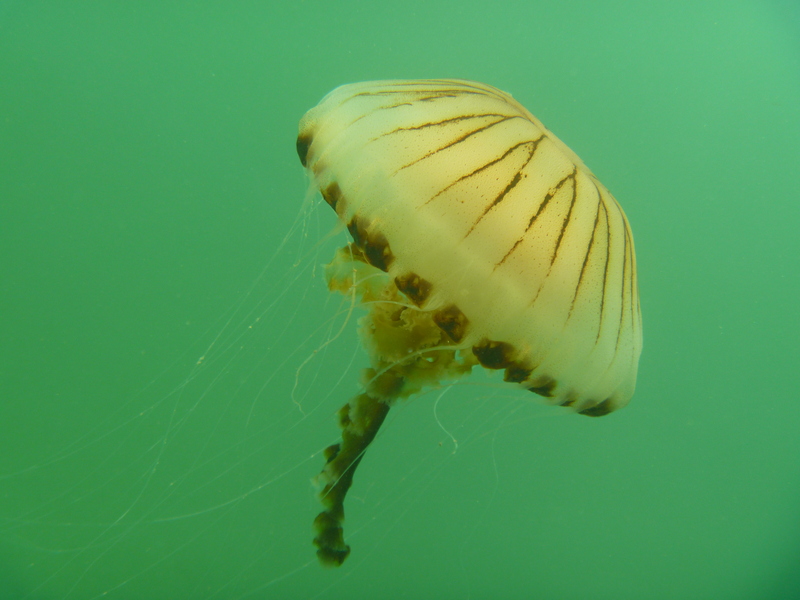 A close relative of this species gave molecular biology ‘green fluorescent protein‘ (gfp). This time we swam out a bit further, over the sandy bottom which seems quite lifeless compared to the rocky kelp forest. However, the fauna is very different here so it was definitely worth it. 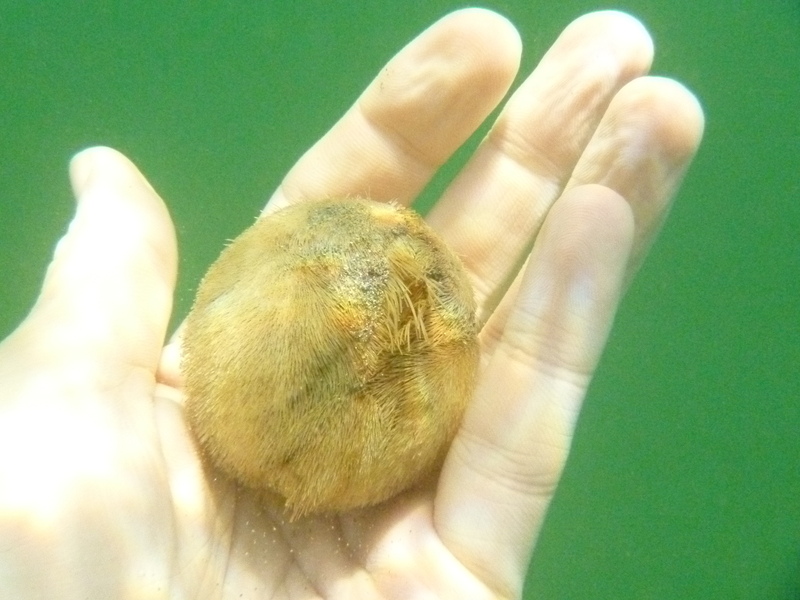 I found my first Sea potato Echinocardium cordatum (about to be eaten by a Spider crab). Near the buoys, at around nine meters depth or so there was (sparse) seagrass. Back on the beach I noticed that my lumix camera was flooded. I was somehow convinced that it could go up to ten meters deep but actually the sticker on it quite clearly stated that it was waterproof only up until three meters….Ah well, I will have to switch back to my Canon Powershot with waterproof case then. *= From the facebook group NE Atlantic Cnidaria: “A. forskalea : up to ca 120 marginal tentacles, usually fewer than the radial canals but ranging from half to twice as many; radial canals 60-80; max diameter ca 175mm” and for A. vitrina: “60-100 marginal tentacles, three or more times the number of radial canals; radial canals 60-100; max diameter ca 100-170mm”. This entry was tagged Aequorea forskalea, Aequorea vitrina, Canon Powershot, Chrysaora hysoscella, Compass jellyfish, Echinocardium cordatum, gfp, Gylly Beach, Lumix, Sea potato. Bookmark the permalink.